WASHINGTON/DETROIT (Reuters) - Toyota Motor Corp will pay a record $1.2 billion to resolve a criminal probe into safety issues, in a deal that could serve as a template for how U.S. authorities approach a similar investigation into General Motors Co. The settlement between the Justice Department and Toyota includes an admission by the auto manufacturer that it misled American consumers about two different problems that caused cars to accelerate even as drivers tried to slow them down. The agreement comes as General Motors is also under investigation over its handling of an ignition switch failure linked to a dozen deaths. GM last month recalled more than 1.6 million vehicles 13 years after first noticing the issue. The payment Toyota agreed to marks the largest such penalty levied by the United States on an auto company, officials said. "My hope and expectation is that this resolution will serve as a model for how to approach future cases involving similarly situated companies," Attorney General Eric Holder told a news conference. Holder declined to discuss GM specifically but Preet Bharara, the chief U.S. prosecutor in Manhattan who joined him at the news conference, made a verbal slip and referred to the case against Toyota as one against GM. He quickly corrected himself. The Toyota settlement marked a huge victory for safety advocates who fought for years for criminal prosecution of automakers over safety violations. Although no individuals at Toyota were charged, the case was the first federal criminal case of its kind since the passage of the first U.S. auto safety law 48 years ago. "It means at the highest levels of the auto company, they have to worry about going to jail if they don't report a defect," said Joan Claybrook, a former president of the nonprofit Public Citizen who favors stricter safety standards. Toyota's North American legal chief Christopher Reynolds said in a statement that the settlement serves to put an "unfortunate chapter" behind the company. The Toyota settlement resolves issues that have dogged the company since at least 2007 and have been linked to at least five deaths. The automaker still faces hundreds of private lawsuits. Prosecutors agreed to defer and drop the criminal charges against Toyota if it abides by terms, including allowing an independent monitor to review the company's safety practices. The monitor, who will be approved by the U.S. government but paid for by the company, will be able to interview executives, take part in some meetings on safety issues and will have a toll-free number for Toyota employees to anonymously report violations. The automaker must report defects to regulators within five days of determining the problems could affect safety. Toyota is "effectively on probation for three years," said Bharara, whose office conducted the investigation. "It cared more about savings than safety and more about its own brand and bottom line than the truth." John Alan James, a governance professor at Pace University in New York, said such provisions in the Toyota deal could serve as a blueprint used by prosecutors in any deal with GM. 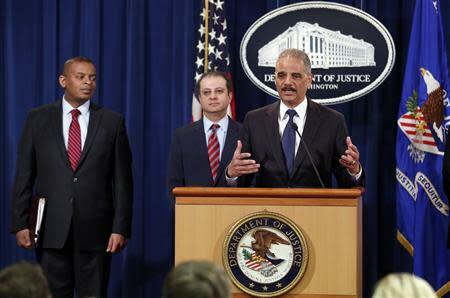 "The Department of Justice enforcement division is all lawyers, and lawyers live on precedents," he said. The U.S. Attorney's office in Manhattan is investigating GM's handling of its ignition-switch recall. GM faces probes by Congress and safety regulators at the National Highway Traffic Safety Administration, as well as lawsuits from GM drivers who say their cars lost value because of the defects. GM Chief Executive Mary Barra has been credited for apologizing quickly for the slow recall and promising to focus on safety. Toyota had played down the problems. However, GM is still under fire for failing to address the defective switches when they were discovered. A GM spokesman declined to comment on whether the Toyota settlement could be a model for his company. GM drivers have described accidents dating back to the mid-2000s in which engines spontaneously shut off, sending cars careening and disabling airbags before the vehicles crashed. Toyota drivers, by comparison, found themselves in vehicles cruising to speeds higher than 100 miles per hour while the brake pedals were functionally disabled. The 1966 Motor Vehicle Safety Act first required manufacturers of cars and trucks to notify the public of safety problems and to act if they find a defect. Congress has amended the law several times but did not add criminal penalties until 2000, and even then it was assumed bringing a case would be difficult. To prosecute Toyota, the Justice Department worked around those requirements by bringing its case under a wire fraud law that they use in cases from securities fraud to political corruption. A document prosecutors filed in U.S. District Court in Manhattan says Toyota "defrauded U.S. consumers into purchasing its products by concealing information and making misleading statements about unintended acceleration." Holder said federal prosecutors in New York "have been appropriately creative in crafting these mechanisms that can be used in similar kinds of cases to hold companies responsible for their actions." 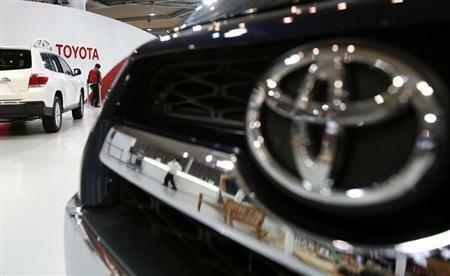 Toyota said it would take a $1.2 billion after-tax charge for the settlement in the fiscal year ending March 31. Toyota dealers said customers have moved on. "It's good to get this behind us, but we don't hear about this at all from consumers," said Carl Swope, a Toyota dealer in Kentucky. The settlement resolves a four-year investigation by U.S. authorities, led by the New York FBI, which conducted more than 70 interviews. Federal regulators opened the 2007 inquiry into Toyota after reports of unintended acceleration by the Lexus ES350 model. The problems gained public attention two years later when a highway patrolman and his family were killed in an accident in San Diego that involved that model of Lexus. A 911 emergency call recounted the family's last minutes: "We're in a Lexus ... and we're going north on 125 and our accelerator is stuck ... there's no brakes ... hold on and pray ..." The call ends with the sound of it crashing, prosecutors said. Toyota responded with a recall of millions of vehicles but left on the road some vehicles including the top-selling Corolla which was described within the company as having among the worst problems with floor mats that trapped acceleration pedals. The company also concealed from the public and regulators a separate problem with the acceleration pedal itself. In fact, the company canceled a design change to address the issue in the wake of the San Diego accident. "Idiots! Someone will go to jail if lies are repeatedly told. I can't support this," one Toyota employee said after a meeting with regulators according to a statement of facts filed with the settlement. That employee's comments came after he reviewed reports from Europe showing the severity of the problem.